So let us start with a look at three wines, including two whites, from Carcassonne wine exporters LGI Wines. The label here sees two fish, one heading in a directly opposite direction to the other, one darker. So what’s the story? The wine goes with fish. True. But look at the wine’s name, referring to two seas. The Sauvignon comes from Atlantic influenced Gascony while the Viognier is sourced in Mediterranean Languedoc. Similarities to Australia here with the fruit coming from different regions. 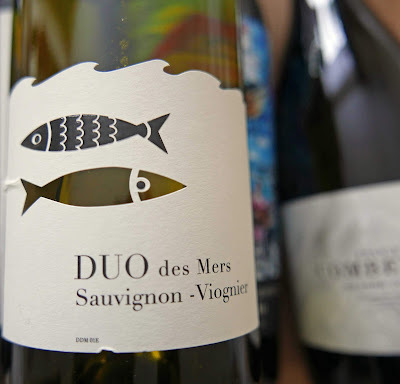 Sauvignon accounts for 70% of the blend in this pleasant easy drinking light coloured wine; the Viognier adds to the white fruit elements in the aromas. On the palate, the blend is fresh, fruity and smooth. Good value and great for a party. Try it on its own as an aperitif or with shellfish, fish, and salads. A relatively plain label on this one, just a selection of curved lines indicating little hills and a few words confirming that it is from the sunny slopes of the south of France. All the fruit - Sauvignon Blanc 60%, Columbard 20% and Gros Manseng 20% - comes from Gascony. Gascony may not often pop up in the wine conversation but it is a producer of lovely fresh white wines and there are many vineyards here and much of the fruit (including Columbard) is used to produce the well-known Armagnac spirit, Gascony’s worthy answer to the Charente’s Cognac. Colour is light straw and the aromas here are mainly those you’d expect of Sauvignon, herbaceous with fruits (e.g. gooseberry, apple). On the palate, it is well endowed, thanks in part to time on both big and fine lees, a tingly touch too and a good finish, somewhat longer than the Duo above. 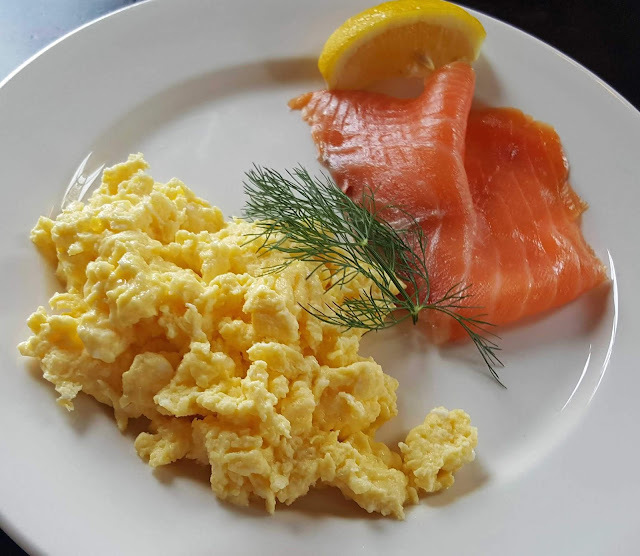 Again pair with fish and salads and treat yourself to a glass beforehand! The SCG is a play on the well known GSM of the Rhone and neighbouring areas. 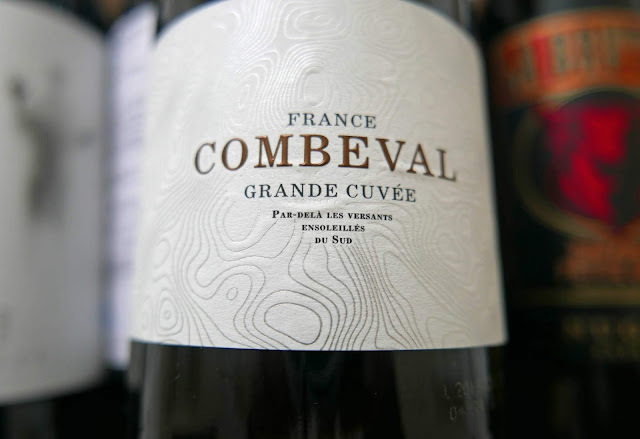 Indeed, Supervalu have the Combeval GSM and the red grapes in the blend are Grenache, Syrah and Mourvedre. Should be worth a try also. 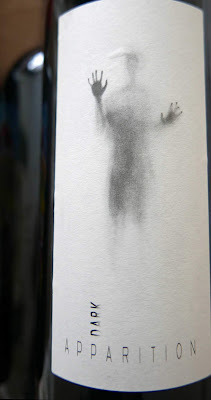 The label shows an ectoplasmic figure trying to break out of its containment unit. The monochrome ghost is, according to the online blurb, apparently trying to express the full body and power of the wine. Really? Let us move on to the grape itself. Unlike many grapes, this one has a precise birthday. In 1855, Henri Bouschet crossed Grenache Noir with Cabernet Sauvignon and this baby was born and has gone on to prove quite popular, especially in the south of France. Unusually, its pulp is red which enhances the colour. It also provides fatness to the wine. Put it all together and you have a Dark Red Apparition! Really? Let us move on to the wine itself, let the Alicante materialise! At harvest, the fruit is divided into two sections. Some fruit goes through the modern process of thermal maceration, most is traditionally fermented on skins for three weeks and is then aged for six months with French oak which “adds complexity” providing a full-bodied cuvée when both parts regroup. Colour is indeed a dark red. Quite a concentrated melange of scents, ripe fruit, floral and vanilla. Smooth and juicy on the palate, concentrated too with initially a slight sweetness, always the merest trace of vanilla, smooth tannins (on the lips), a good dry finish. The Alicante is well and truly out of the bottle and it is an excellent drink. Really!